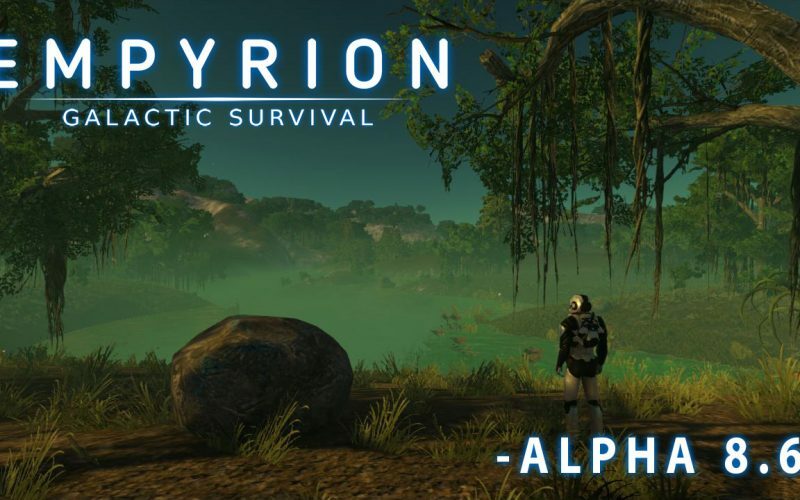 Empyrion Galactic Survival will plunge you into a deep, open-ended sci-fi universe to explore, survive, and create within. The crafting and construction system will be your sculpting tools. An entire solar system full of spectacular vista awaits your discovery, creativity, and imagination. In development since 2013, Empyrion is in early access. Eleon Game Studios is out of Switzerland and is a fairly small staff. Regardless of the size of the studio, Empyrion sees sizable additions on a regular basis. Currently in Alpha 8.6, the game features a plethora of functionality that makes it a direct competitor to a lot of the other AAA space titles offered. The story beings in 2402 with the Earth in peril. With resources nearly tapped out, and the environment doomed at best, the lucky discovery of an ancient yet advanced alien space craft previously hidden beneath the ice, gives mankind a new breath of hope. By providing new space-faring and energy technologies and a hopeful destination among the distant stars – a promised land referred to as Empyrion according to the records on the alien ship – mankind earns one more chance to survive. You’ll find many wrecks. Hopefully you avoid such a fate in Empyrion. The player wakes up in an escape pod plummeting towards the surface of an unknown planet. With supplies quickly running out and surrounded by a hostile environment the player must act fast to find or create shelter and establish a way to survive. Food and oxygen are the staple to survival and can be in very short supply. The environment’s temperature swings and radiation can be deadly – severe weather can further complicate matters. Vicious creatures lie in wait to attack the lone survivor. Building resources can be scarce or dangerous to obtain. The chosen starting difficulty determines if the unknown planet you find yourself stranded on is a lush temperate planet full of life and resources or a hostile, barren lifeless world devoid of even a breathable atmosphere. Players can take on a variety of open-ended roles: Farming, mining, construction, piracy, trading, mercenary-style work, or even a hermit lifestyle hidden away from the rest of the world living off the land. Some of the more economy-based play styles are only really viable in a cooperative multiplayer population where there may be a need for farmed or manufactured goods by individuals that would rather trade credits than spend time producing those trade goods. The construction and building mechanics are similar to many other popular voxel-based construction games. Construction of materials, components, tools, food, and blocks requires a variety of resources and processes. Building is as anyone might expect from a block building mechanic. Some species you meet may not exactly be inviting. One might think that the block-based construction system would limit creations to anything that might be seen in a game of Minecraft, but the large variety of shapes and blocks available allow for some highly realistic levels of creation. The Empyrion Steam Workshop is full of community creations that absolutely do not look like they are made out of mere blocks. The depth of customization and creativity that can go into builds makes Empyrion a leader among any other game that features a similar block-construction system. Bases are well.. bases. They don’t move, allow a variety of utilities, and can be constructed to serve one or all types of functions – tactical operations center, shipyard, construction yard, refinery, landing pad, hospital, farm, military complex, defensive compound, battle positions, etc. Bases can be built on planets, moons, in orbit, or even affixed to asteroids. Capital Vessels are larger ships that are much like moving bases. They too can be farms, construction plants, tactical operations centers, landing pads, hospitals, farms, military vessels, etc. They can also serve as carriers for Small Vessels and Hover Vessels, orbital mining craft, cargo haulers – really the limit is the player’s imagination. Small Vessels can be fighters, bombers, cargo carriers, etc. They can dock to Capital Vessels and Bases. They can also be space faring or purely atmospheric. Hover Vessels are terrestrial craft that can serve as transport, cargo, terrestrial mining craft, hover bikes, and even hover tanks. They can dock to capital vessels and bases. Build your own capital vessel and risk taking it into combat for great reward. Sometimes, however, the risk will leave you in the rubble of your destroyed ship stranded on an alien planet behind enemy lines. The game is played from the perspective of the player – first person or 3rd person. The player can equip a large variety of tools, weapons, and armor. Armor can accept modules that give the worn armor a variety of properties that allow the player to better survive combat or harsh environments. The world is a solar system. There are prefabricated solar systems and procedural generated solar systems. 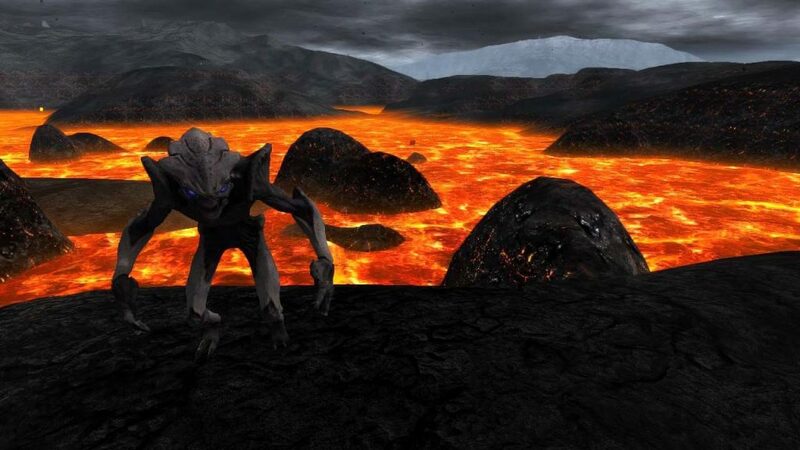 Planet and moon types can be Temperate, Barren, Desert, Arid, Swamp, Ice, and Lava types – each with their own challenges. There are asteroid fields around planets and also in orbit around the local star. There are dangerous creatures and alien factions – some hostile and some peaceful. 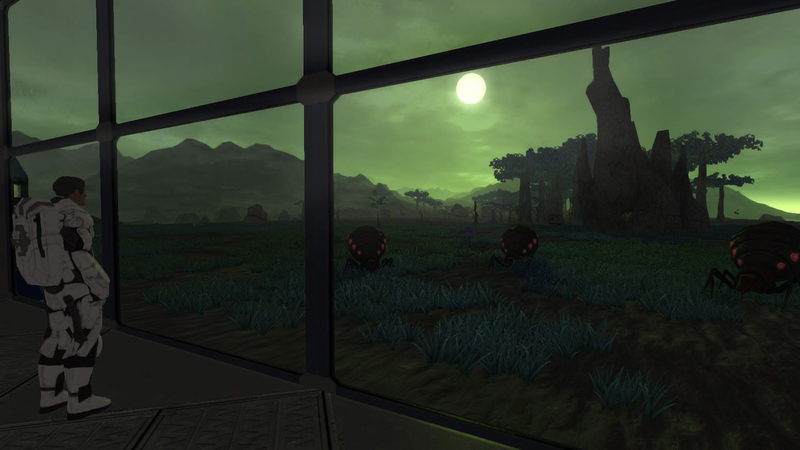 Dangerous enemy bases and friendly trading stations and towns populate the solar system. Primitive tribal cultures inhabit some of the planets. Some of the AI is a bit wonky but the AI has definitely seen vast improvements in both fit and behavior over the patches. Explore lush temperate planets that have never been seen by human eyes. You will have a lot of content to explore solo or with friends in multiplayer. The planets can be upwards of 64 km^2 which doesn’t sound large at first but once you are on the planet, in the jungles or flats of a desert, it can be quite massive. The enemy bases and installations provide a wide degree of difficulty. Some are fairly quick to assault and conquer while others will require actual planning and a phased approach to defeat. Many hold hidden secrets and some have terrifying fates. You may even find a derelict ship or two floating in orbit to take advantage of. There is also a small collection story-driven missions that the player can undertake. These have seen a lot of attention from the development team recently and that trend is expected to continue. All of this comes in both single-player and multiplayer. Multiplayer can be a mix of PvE and PvP with the default random seed generating a mix of PvE and PvP playfields. In these mixed play style solar systems, typically the environments that are more challenging are PvP. Server administrators can go further and control what playfields are open to PvP, if any at all. 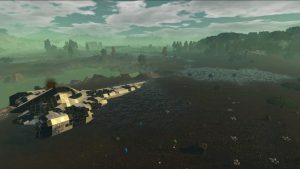 The one large lacking feature in multiplayer is the ability for players to walk around a capital vessel while it is underway. Getting out of a seat while the ship is being piloted by another player results in the non-seated player falling out of the vessel. I understand that this requires a bit of effort and devotion by the development team – time and effort that could be better spent elsewhere – but I’d really like to see this “problem” be resolved eventually as I feel it would really add to the multi-crew game play. Players can create and join factions which can then be used to allow faction access to player-created structures. Furthermore – doors and containers can be given codes to unlock them so while an entire ship might grant access to all faction members, a crew member can password lock his personal quarters on board the ship. 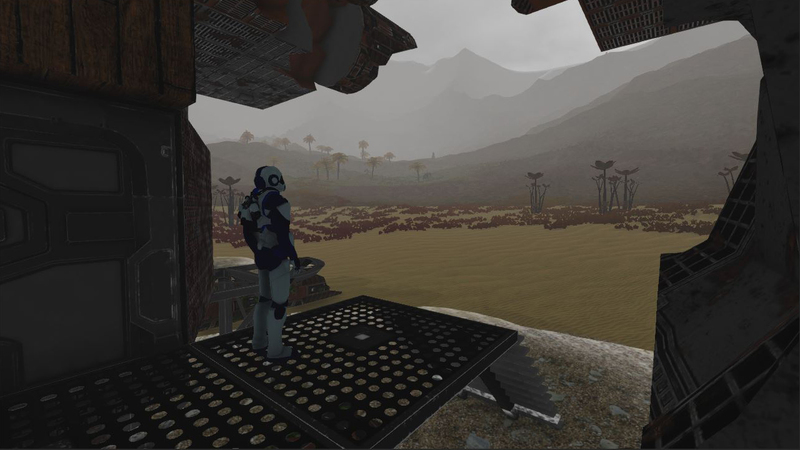 All-in-all, the gameplay experiences in Empyrion are vast and largely open to the player’s imagination and desires. You are given a solar system to live in – go live in it however you want. Each sunrise is a new beginning… and a beautiful sight to behold! 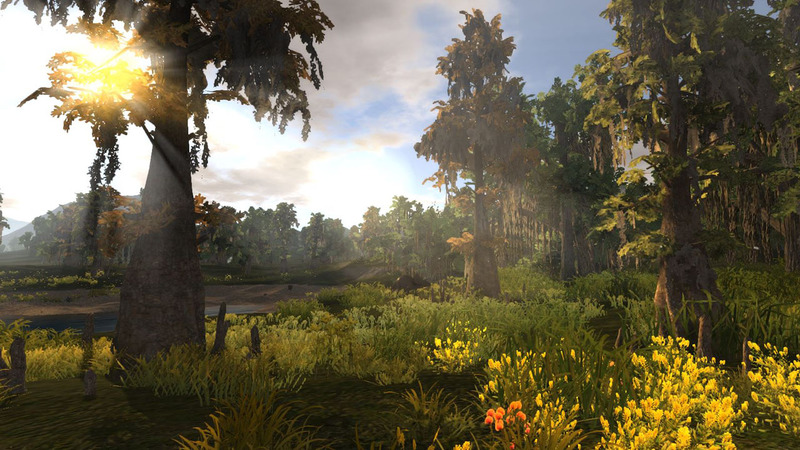 Empyrion provides the player with spectacular scenery. Playing Empyrion left me with this sense of visual wonderment. The views of the various environments never failed to capture that air of endless adventure as I explored each unique landscape that was brought before my eyes. The lighting and landscapes are really what set this game apart from a lot of other titles. Watching the sunrise on an alien planet and see the fog clear through a valley that has been untouched by any explorer is absolutely breathtaking. I was a bit skeptical on the engine’s capability to render large structures and sprawling landscapes without taking a performance hit. Empyrion really surprised me with how it manages what is rendered and what isn’t. A lot of other games with player construction should take note. Empyrion’s engine only renders what can be seen – it’s smart and intuitive and it knows which sides of blocks aren’t accessible to the player and simply doesn’t render them until they are. I was very easily able to create massive bases and ships with well over 50,000 blocks and no noticeable performance hit on my mid-tier gaming laptop. Some of the textures and block-shapes present a late 1990’s feel at times, especially when viewed up close, but that is to be expected out of such a construction mechanism. The development team is constantly adding new texture and color optimization options – Alpha 8.6 added unlimited color selection instead of just selecting some pre-created colors. 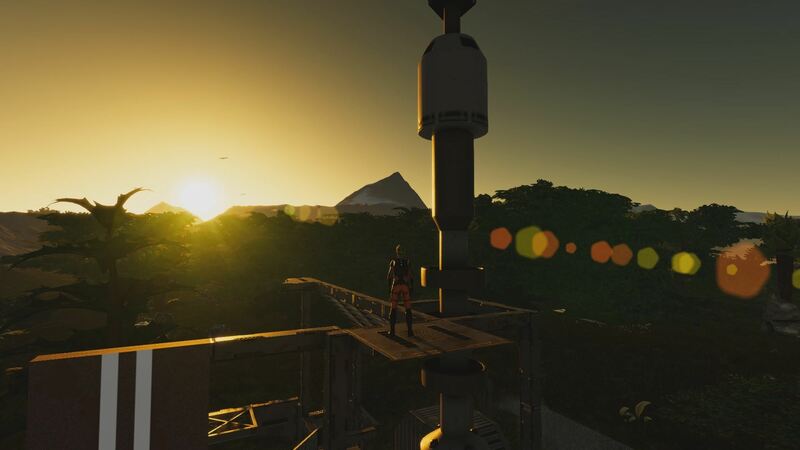 Beautiful scenic views are around every corner in Empyrion. Of course there are the creepy sounds some of the creatures make, especially when they sound like they are right outside the door of your base waiting to attack you or even worse – when you are in the middle of a forest at night with no lights and you hear something rustling in the bushes. Empyrion had the hair on the back of my neck standing on end a few times due to this effect. For as complicated as the game seems, the controls are fairly straight forward. There’s the typical WASD + mouse first-person shooter controls wrapped with various system controls. Players will be expected to turn on and off ship or base power, open and close helmets, turn on and off jetpacks – there are a lot of toggles really. Inventory management is a large part of the game. You will find yourself moving things between containers, picking things up, adding things to constructor queues. A lot of clicking and dragging supplemented by a few keyboard shortcuts to speed things up. Although, inventory management doesn’t feel like a chore, which is refreshing. Players can control via the inventory what goes into their toolbar which is activated by pressing 1 through 9 on the keyboard – 0 is unequip anything you have in your hands. The tutorial does a decent job in getting the player started on the controls. Players will know 95% of the controls by the end of the various tutorial missions and have a decent understanding of how to play the game. The remaining control functions can be gleaned quickly and easily from the control options in-game. Empyrion absolutely has a sandbox aspect at the core. It’s designed for players to come into its universe and have at it, however they want. This affords a great deal of replay value. Face hostile aliens in harsh environments… if you dare! The NPC installations, commonly referred to as “POI”‘s or Place of Interest, have a large variety but once you’ve assaulted and triumphed over the challenges of one, it is a fairly repetitive process. However, in a multiplayer scenario where you are competing militarily and economically against other players, even if it isn’t directly in combat, the POI’s offer great risk with the potential for great reward – the loot from a POI can be tremendously beneficial to any player. POIs also respawn at a predictable rate unless you are playing on a multiplayer server where the server administrator has changed the default settings. Many players enjoy building their own solar system solo. Others prefer doing the same with friends. 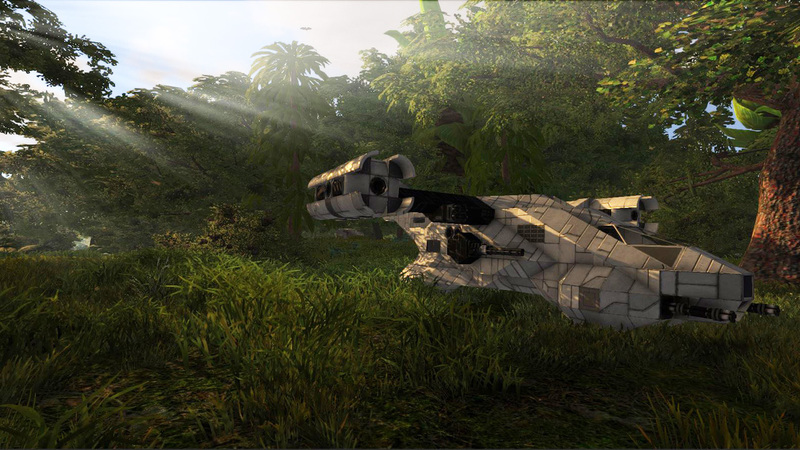 Many players just like seeing what they can build – as seen by the Empyrion Steam Workshop. Players will build things out of their imagination or inspired by their favorite sci-fi universe (See: Alexander-Class Advanced Destroyer). Some of the creations in the workshop are absolutely amazing – the attention and level of detail that goes into some of the creations is absolutely artwork. The workshop brings an added layer of replay value – I check the workshop weekly for new additions that appeal to my tastes and I add them to my game. Being one that isn’t as creative as others when it comes to putting together a spacecraft, the workshop allows me to skip that process and ride on the backs of other blueprint designers that actually know what they are doing. The blueprint factory is simple – the blueprint tells the player what materials are needed and the player provides those materials and after a build time specific to how long it takes the factory to construct the blueprint, the player can spawn the blueprinted item into the universe. Only because it’s going to get asked. I’ve played both games a lot. While they are similar: voxel-based construction and spacemans. That’s where the similarities end. Space Engineers is about.. well… engineering stuff to work. You build A + B which produces C. You connect C to D and F and you also make G. Things need to be connected to other things for maximum efficiency. You can build robots, automated things and stuffs, factories, etc. There’s a lot to build and a lot that can be built. There’s a really deep rabbit hole of engineering in Space Engineers, especially compared to Empyrion. Empyrion is about survival. Empyrion has a ton more PvE content than Space Engineers. The engineering aspect is there but you don’t have to connect cargo boxes with constructors or refineries using conveyors. There’s a lot less engineering to Empyrion than is had in Space Engineers. The comparison is similar to the popular comparison of Diablo III and Path of Exile – Similar but very different at the same time. An entire solar system full of spectacular vistas and captivating exploration awaits you in this open-ended sci-fi survival adventure. The only limit will be imposed by your imagination. Overall, Empyrion brings a lot to the player, especially after you consider that it is the product of a small studio. Empyrion will give you several hundred hours of fun or more. Throw in some friends and maybe enemy players and the potential for fun is only limited by your group’s imagination!